Today, March 30, is — we are told — “National Pencil Day“, marking the advent of a patent on the pencil with an attached eraser. I’ll put aside the fact that this hardly represents the most significant event in the history of the pencil, and the inaccuracy of the linked WN article about Lipman creating the wooden pencil (he did not — see my post on the history of Pencils); and I’ll even overlook the likelihood that this is merely a marketing ploy on the part of pencil manufacturers, and instead use it as an excuse to celebrate pencil drawing, with a few nice examples from history. To do that, I had to go no further than the mind-bogglingly deep catalogue of drawings in the collection of the Metropolitan Museum of Art, from which I’ve selected a few done in graphite. Should you choose to do the same, here is a link to a search of the online collections for works marked with the tag “graphite”. 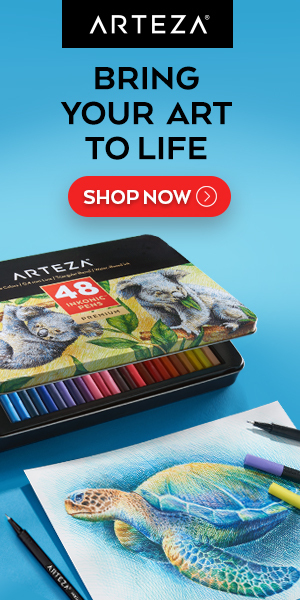 This will turn up many watercolors, ink and wash and other drawings in which graphite was incorporated or used as a start, but there are enough actual graphite drawings to keep an interested pencil drawing aficionado occupied for hours. Most of them are available in high-resolution versions. This tiny selection of pencil drawings is merely (if you’ll excuse the expression) scratching the surface — so I’ll tack on a Time Sink Warning. Images above, with details: Jean Auguste Dominique Ingres, Samuel Prout, Samuel Amsler, Carlo Ferrario, Charles R. Knight, William Trost Richards, Alexandre Denis Abel de Pujol, John Singer Sargent. Link: Met Museum search tagged "graphite"
On Google Art Project. Downloadable high-resolution version on Wikimedia Commons. Original is in the Alte Nationalgalerie, Staatliche Museen zu Berlin. I had seen reproductions of this painting before, and has assumed it was a watercolor from the translucency of the leaves and the graphic nature of some of the architectural elements, but it’s oil on paper, laid on canvas. This is one of several paintings by Blechen of the interior of the Palm House (Pfaueninsel) in Berlin. You can see two others here and here. I first wrote about Virginia painter Duane Keiser back in 2005, when I noticed his blog, a painting a day, on which he was featuring small, postcard size paintings — one a day as he painted them on a makeshift cigar box easel — and placing them for sale on eBay. At the time, this was a novel idea, and I don’t think Keiser, or anyone else, could have anticipated that it would blossom into the “painting a day” phenomenon, or that it would help pave the way for a fundamental change in the way large numbers of artists would come to use the internet to connect directly with collectors. Since then, I reported on Keiser at various points as I chronicled the growth of the painting a day approach, and I’ve also more recently highlighted a couple of his interesting experiments in repainting the same canvas repeatedly (see my links below). It occurred to me, however, that I’ve been remiss in not revisiting Keiser’s continuing work as a painter, particularly his ongoing posts to a painting a day, which are a continual delight. You can also see his work on his website, and a number of interesting videos of his process on YouTube. Keiser has a keen eye for subtle color, a command of painterly textures and a finessed attention to edges. His seemingly simple subjects quietly reveal themselves as sophisticated balancing acts of suggestion and definition, dynamically playing one element against another within a unified, understated whole. Lines and Colors posts tagged "painting a day"
Scott Kikuta is a concept artist and illustrator working in the video gaming industry. His credits include Scribblenauts Unlimited, Dungeon Siege II: Broken World, Dungeon Siege II, Dungeon Siege: Legends of Aranna, and Halo 3. In a field that is often dominated by heavily rendered approaches, Kikuta has a deft, light touch. He often contrasts dark, textural foreground objects against faded suggestions of background elements. Many of the pieces on his blog, that I take to be personal projects, include amusing details, as I’ve tried to show in the top three pairs of images and detail crops, above. His website is undergoing renovations, but there is a selection of prints on his society6 store. Kikuta has also created a set of collectable trading cards called CrayonMonsters (image above, bottom), but I don’t know where or if they are available. On Google Art Project. Downloadable high-resolution version on Wikimedia Commons. Original is in the Yale Center for British Art. This is a capriccio, or invented architectural scene, yet the details of daily life feel unerringly true, as does the play of sunlight against those few elements not in shadow. Ink and wash drawings like this, despite dealing with value in a way analogous to paintings, have a character of line that give them a unique visual appeal, unattainable in other media.